Created in cooperation with Iwata, our exclusive Blick Complete Airbrush System contains everything beginners need to start airbrushing. 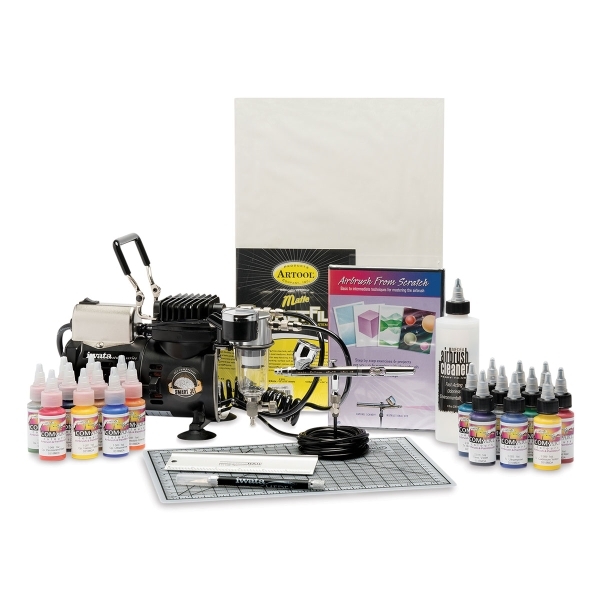 The system is built around the Iwata Eclipse HP-CS dual action, gravity feed airbrush. It has a unique 0.35 mm needle/nozzle combination that enables you to execute fine detail spraying as well as high paint flow applications. Versatile enough for everything from fine art and illustration to auto detailing, this airbrush has the capacity to spray heavier acrylics and textile paints as well as traditional airbrush colors, so it's a great tool for experimentation as your skills grow. Also included is Iwata's zero-maintenance, oil-less Smart Jet Compressor — powerful, compact, reliable, and quiet. Suitable for a variety of general use applications, it offers a maximum working pressure of 35 PSI, never needs lubrication, and shuts off automatically when not in use. Start painting right away with the Airbrush from Scratch DVD included in the set. It takes you through all the basic airbrush exercises and techniques you need to know, using the 20 different Iwata Com-Art Airbrush Colors that come with the system. The Blick Complete Airbrush System contains everything beginners need to start airbrushing including an Iwata Eclipse CS gravity feed dual-action airbrush. This video details all the components and provides a great demonstration. A Blick Exclusive!